This past week showed here in Destin we are not immune to the violence that plagues big cities. In the span of a few days there was a shooting in a parking lot by Bric a Brac. The authorities found shell casings and blood but not victims. Then on Valentines day someone placed a pressure cooker on a curb by McDonalds. The authorities didn’t take any chances. They had a bomb squad come from Bay County. Hwy 98 was shut down and McDonalds was evacuated. Traffic was a nightmare as you could imagine. Glad to say it was not a bomb but there is some sicko out there trying to make some kind of point I guess. Finally on Friday night sheriff’s deputies shot and wounded a guy who pointed a gun at them. It was reported the guy wanted to die by cop suicide. Another sick person. Now the deputies have to live with this. Ok, enough of that. Sunshine Cindy and I had a lot of fun “playing” the last few days. Thursday Sunshine Cindy went to our CPA to drop off our taxes. Since she was in Fort Walton decided to meet at AJ’s Oyster Shanty after I got off work. 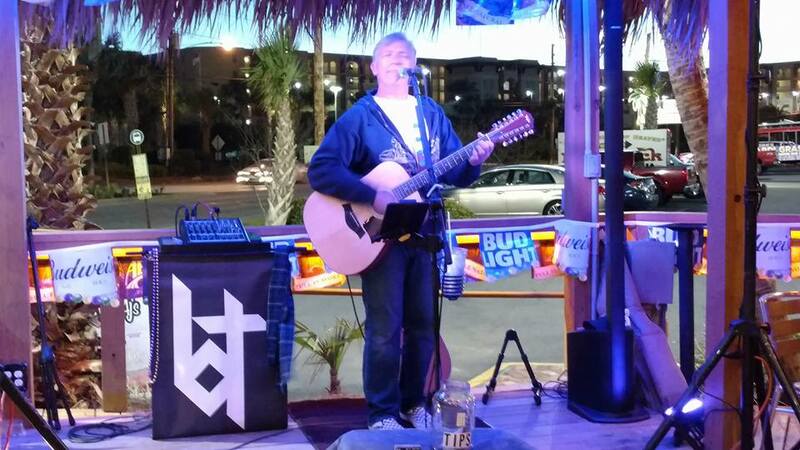 BT was going to be playing on the deck. It was a cool evening but we had a good time. Wayne came for a while then Kenny and Tommy also came and joined us. Many snowbirds came out and a good time was had by all. Friday we went to Crab Island Cantina to enjoy a nice day. We got to talking to some tourist who were in town for a week. They are from Illinois and said they love coming this time of the year. Bobby was taking care of us and the others at the bar. Our friends from Atlanta, Fred and Georgia were in town and came down and joined us. It was great seeing and talking to them. Then we had our friends Alan and Jackie come down with their daughter and son-in-law Kistin and Jeff. It was great catching up with them. They all headed to the Ramada on the island and we went to join them. But before we could get to our car we ran into Judie and Kelly. They were with one of their sons enjoying the harbor. As we talked to them Glen walked by. He was on his way to Harry T’s to smoke a cigar. It was cool running into our different friends. When we got to the Ramada we got a big table and had popcorn and pizza. Alan and Jackie go to this bar all the time and they know everyone that works there. Jeff nicknamed Alan “The Godfather” of the Ramada. The name fits as it seemed like the staff came by to get some words in with him. LOL Sunshine Cindy and I had fun hanging with them. Saturday we met up with Alan, Jackie, Kistin and Jeff on the harbor. We started at The Boathouse. There was a big crowd for the middle of the afternoon. Our next stop was The Red Door Saloon. As we walked in Scott was there and he gave us a big hug. He was riding his bike with a friend enjoying the nice afternoon. Our next stop was Duck Duck. Walking over there we were wondering what was being built where Woody’s used to be. A crane was there and some major construction is underway. As we walked over there we saw three guys standing on the ledge up the hill. They hollered down at us wondering where we were all from. It turns out they are the people building the place we were wondering about. They plan to open a seafood restaurant in about 6 months or so. They also are thinking of putting a Dat Dogs in there. This is a NOLA hot spot. They still don’t have a name for their new restaurant. Sunshine Cindy suggested “Chaos on the Harbor.” They seemed to like it. I will not be surprised if that’s what it ends up being. At Duck Duck a guy who lives on a sailboat in the harbor brought over some ribs that he smokes. Alan bought a plate from him. They were fantastic. 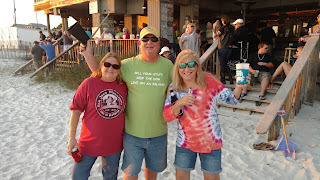 His name was Clancy and he looked like a typical Destin character. Our next stop was AJ’s. The entire bottom floor of AJ’s is being remodeled. It looks like it is going to be a nice place. The bar is being moved and it will be easier to get around. Our next stop was Harry T’s. We sat upstairs and had a fantastic sunset. As the Illinois crew headed back to the island Sunshine Cindy and I stopped at Landshark for a pizza and beer. It was a fun day. Sunday Sunshine Cindy and I took a road trip. We hit Waffle House for breakfast then headed to Panama City Beach. We wanted to check out the Reef where we will be staying during Rendezvous. The Reef is right next to Sharkey’s where the event will be held. It’s a great location. After checking out the motel we went to Runaway Island. The holiday crowd was big and the place was understaffed. But we had a beer at the bar so it was all good. We headed back to Destin and took 30A to see if we could find someplace to stop. The 30A area is now home to many wine bars, yuppie types and one development after another. We could not find a dive bar. Seaside was packed with people. We pulled into the Grayton Beach area but could not find a parking spot to go to the Red Bar. So we continued towards Destin and went to Old 98 to cruise up along the beach. We stopped at the Surf Hut. They had all the windows open and a nice breeze from the Gulf was blowing through. While there we saw an old friend. Ruth is someone we used to see all the time. We heard she had some type of medical issue a while back. It must have been a stroke or something similar as she could not talk but she had a tablet to write to communicate. Other than not being able to talk she seemed to be in good health and spirits as she sipped on her wine. 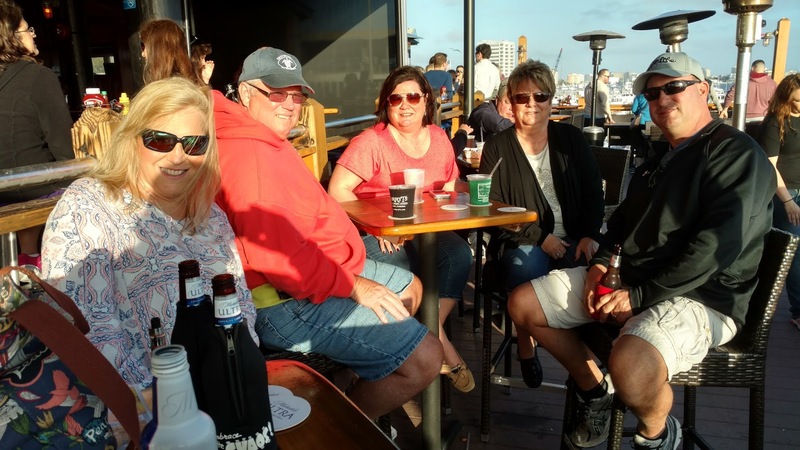 We got a message from Cathi and Wayne to come join them at Whale’s Tail for sunset. They always have a big celebration there. It took three passes before we found a parking spot but it was worth it. A lot of folks were there and we had a good time with Cathi and Wayne. The sunset was awesome! From there we stopped at Funky Blues Shack for some dinner and to listen to music. It was a perfect end to a great day. Spring Break is right around the corner. The slower pace of the snowbirds will be replaced by young’uns having a good time. Bring it on! lol See ya next Monday!